Researchers are developing a monitoring system similar to those used by earthquake seismologists to detect tiny cracks in bones, a technology that could help prevent fractures in humans and racehorses.The new monitoring system records "acoustic emission data," or sound waves created by the tiny bone fissures. The same sorts of acoustic emissions are used to monitor the integrity of bridges, other structures and mechanical parts like helicopter turbine blades, said Ozan Akkus, an associate professor in Purdue University's Weldon School of Biomedical Engineering. "When a microcrack occurs in a bone it generates sound waves similar to those created by earthquakes," Akkus said. "The goal is to create a wearable device that would alert the person when a stress fracture was imminent so that they could stop rigorous physical activity long enough for the bone to heal." Researchers at Purdue have designed wearable acoustic emission sensors, which could be used to monitor the formation of these "microcracks" in bones that can lead to hairline stress fractures unless detected in time. The technology might help prevent serious fractures in racehorses that could cause lameness and lead to more serious catastrophic bone failure. Monitoring the formation of "microcracks"
Catastrophic injuries are rare in racehorses but still remain a major concern to horse owners and racing fans. This problem was highlighted by the recent tragedy involving this year's Kentucky Derby second-place finisher Eight Belles. The 3-year-old filly broke both ankles as she was slowing down at the end of the race and had to be euthanized. Big Brown won both the Kentucky Derby and Preakness Stakes and is favored to win the Belmont Stakes on Saturday (June 7). 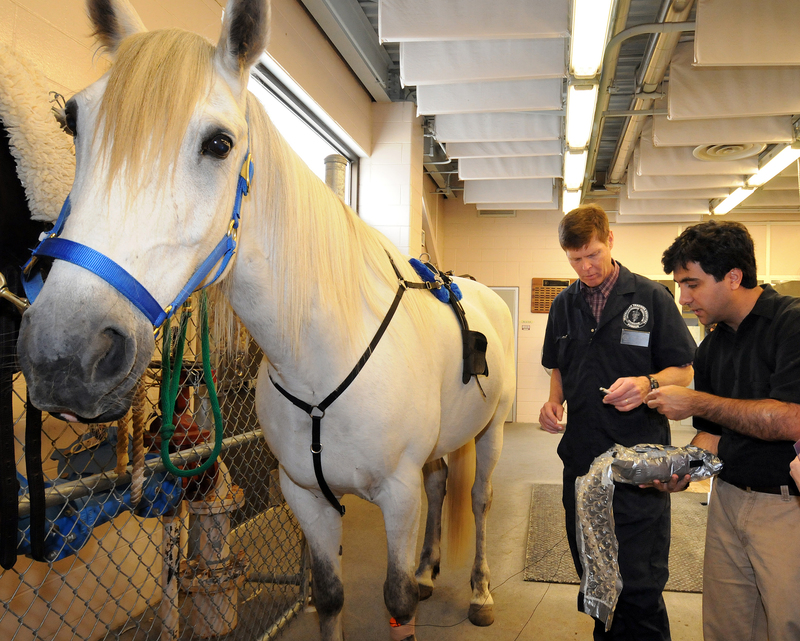 "The need for new technologies to prevent stress fractures and the many other causes of catastrophic injury to racehorses is great," said Stephen Adams, a veterinarian and professor in the Purdue School of Veterinary Medicine. "There is a huge investment in thoroughbred and standardbred horses, and a thoroughbred racehorse can cost between $4,000 to $10 million and cost thousands more each month for training. About 70 percent of young thoroughbreds develop microcracks in their cannon bones known as bucked shins. About 10 percent of horses with bucked shins will have radiographic evidence of stress fractures. One of our goals is to prevent stress fractures and curtail catastrophic fractures." Estimated losses attributed to bone fractures in thoroughbred or standardbred horses used in the horse racing industry exceed $10 million annually. 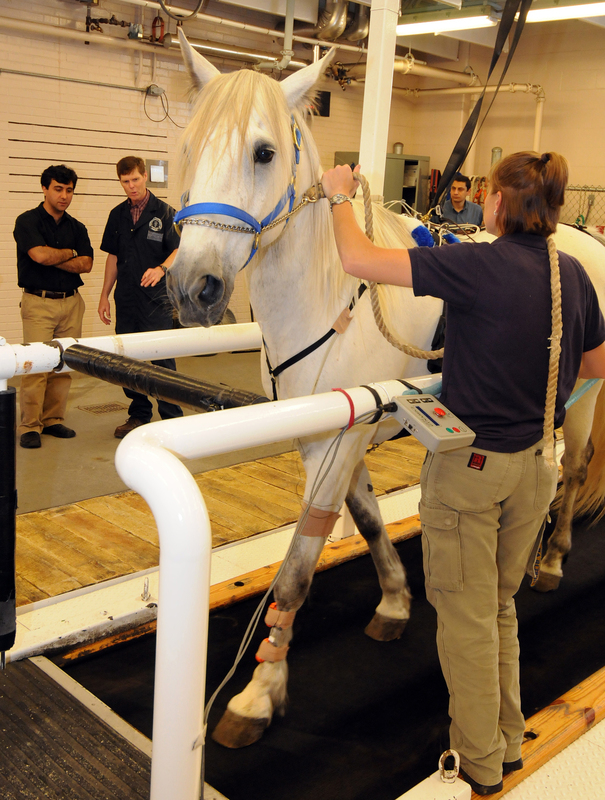 "While it is still in the early stages, this technology holds great promise for horses," said Adams, who specializes in equine lameness and surgery and is collaborating with Akkus in testing the system on horses. "These horses are running 40 miles an hour, and if there is a microfracture in the animal there is danger it will become a catastrophic failure. Currently, microfractures are not visible on an X-ray, and we need a viable way to detect tiny fractures before they become stress fractures or catastrophic fractures." Shane Fimbel, technology transfer manager for the Purdue Research Foundation's Office of Technology Commercialization, is working with Adams and Akkus to move the technology to the market. "This technology is important in many ways, but in particular with horses and other animals because they cannot articulate why they are in pain," Fimbel said. Such a technology also might protect soldiers, athletes and dancers. Akkus will be visiting West Point this summer to test the monitoring system on cadets going through basic training. Depending on the service branch and type of training, 5 percent to 20 percent of U.S. basic training recruits experience stress fractures of the lower extremities, with the highest incidence in women recruits, Akkus said. About 5 percent to 10 percent of athletes experience stress fractures. A stress fracture occurs because cracks form when mineralized collagen fibers in bone fail, producing sound waves that cause a rippling motion on the skin's surface. As hard as it is for humans to discern the pain due to developing stress fractures, it is relatively impossible for a horse to overtly display its discomfort, making this technology all the more valuable for equine applications. "Ultimately, we would like to do real-time monitoring of damage activity and learn how to distinguish between a small crack and a more structurally threatening defect," Akkus said. "There are different types of cracks that occur, and it's important to be able to distinguish among them so that we can determine how serious the damage is." To differentiate the various types of cracks, researchers are integrating "pattern recognition" software and earthquake models, working with Robert Nowak, a Purdue professor of earth and atmospheric sciences. The multidisciplinary research involves biomedical and electrical engineering, veterinary medicine, and earth and atmospheric sciences. Bones most affected in horses are the cannon bones of the front limb, which are the equivalent of human finger bones. The most commonly affected bones in humans are those in the feet, legs and hips, particularly the ball-and-socket joints that connect the legs to the pelvis. Researchers at Purdue and the University of Toledo have jointly filed patents on the discovery through the Purdue Research Foundation Office of Technology Commercialization. The Purdue Research Park is part of the Purdue Research Foundation, a private, nonprofit foundation created to assist Purdue University in the area of economic development. In addition to the Purdue Research Park in West Lafayette, the foundation has established or is currently constructing technology parks in other locations around Indiana including Merrillville, New Albany and Indianapolis.